It gives me great pleasure to introduce the fifty-fifth Edington Festival of Music within the Liturgy. Whether you are an annual supporter of the festival or visiting for the first time, have travelled a long distance to be here or are resident in the village of Edington, whether a regular member of the Church congregation or simply a lover of good music, we look forward to being with you for this feast of worship and music. On behalf of all the participants in the 2010 festival, a warm welcome to you all. 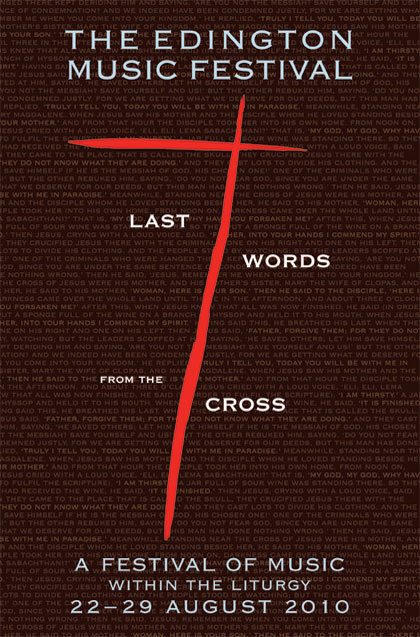 In each day of this year’s festival, we will explore through words and music Christ’s Seven Last Words from the Cross. The Passion of Our Lord has of course been the inspiration for the greatest sacred music across the centuries, as composers have reflected upon and responded to the events surrounding Christ’s death on the Cross. To those bystanders looking on as Jesus endured his final hours, these sayings must have seemed confusing, nonsensical and even to some blasphemous. Not until the earth was shaken and the sky darkened did it begin to dawn on the centurion that ‘Truly this man was God’s Son!’ We, however, can look at Jesus’ sayings in the light and joy of the resurrection: knowing what was to come after his death points us to the true meaning of his final words, which far from being concerned with his own death look forward to the promise of eternal life, crystallizing the message and values that lie at the heart of the Christian faith. Even in his last hours, Jesus shows us how to love our enemies, forgiving those putting him to death. He demonstrates that ‘everyone who believes in him may not perish but have eternal life’, promising a place in paradise to the criminals hanging either side of him. We explore these themes of forgiveness and eternal life in the opening days of the festival week. The middle of the week takes on a Marian theme as we look at Christ’s last words to his own mother. We watch and weep with her at the foot of the Cross in the words of the hymn Stabat mater dolorosa. The anguish of this medieval text has lent itself to many monumental musical settings, and this week we hear those by Palestrina and, in Thursday’s Sequence, Domenico Scarlatti, whose remarkable setting is scored for ten voices and continuo. Thanks once again to the generous support of the Festival Association, we have been able to commission the young contemporary composer Graham Ross, newly appointed Director of Music at Clare College, Cambridge, to set words from the Stabat mater as the introit at the BBC broadcast of Choral Evensong on Wednesday. Christ’s sayings on the Cross show us also that he too was human. His cry ‘Why have you forsaken me?’ reminds us that as well as being true God, he was also true man, sharing our human emotions and pains. His words ‘I thirst’ speak to us not only of our physical needs, but our spiritual need to ‘hunger and thirst after righteousness’. We look forward to welcoming the Reverend Canon Chris Chivers, Canon Chancellor of Blackburn Cathedral, who will address us on this subject at Friday evening’s Eucharist at which we will hear Lassus’ great parody Mass Vinum bonum. As the festival draws to a close, we reflect on the words ‘It is finished’. For Christians these words signal not the end of life, but the beginning; a work completed, opening the kingdom of heaven to all believers. As Charles Wesley writes: ‘Love’s redeeming work is done; Fought the fight, the battle won.’ Our final Evensong of the week features the Howells St Paul’s service followed by a setting by Parry of John Donne’s Holy Sonnet VII: ‘At the round earth’s imagined corners blow your trumpets, angels, and arise, arise from death, you numberless infinities of souls’. As Jesus finally commits his spirit to his Father, so we commit ourselves afresh to his service and to one another as another festival draws to a close. Along with the wealth of polyphony that we shall enjoy in our worship again this year, the offices of Matins and Compline continue to be at the heart of the festival, sung to plainsong by the Schola Cantorum which will be directed for the last time this year by Andrew Carwood who retires from the festival after some 23 years. Andrew has served the festival with great distinction as a singer, Festival Director (1992–1997) and subsequently Director of the Schola. He will be greatly missed not only by his colleagues in the festival but also by those in the village whom he has come to know over these many years. We thank him for his rich contribution to the festival, and look forward to welcoming Benjamin Nicholas, Director of the Tewkesbury Abbey Schola Cantorum of Dean Close Preparatory School who will direct the Edington Schola from next year. Another Edington milestone is reached this year by John Barnard, who will be celebrating his fortieth festival with a reunion of former members of the Schola on Saturday 28 August. We thank John for all he continues to contribute to the festival both in front of and behind the scenes. As well as welcoming many new singers to this year’s festival, we welcome as this year’s Festival Organist Peter Stevens, Organ Scholar of Westminster Cathedral and former Organ Scholar of King’s College Cambridge. We thank him and Chris Totney for their playing during the festival which does so much to enrich our worship. There are many people to whom I would like to express my thanks for their enormous amount of work, without which we would have no festival. In some senses I am reluctant to single out individuals, as one of the great joys of Edington is that everyone involved plays an important part in some way or the other, giving of their time and talents for the worship of God through beautiful music in the beautiful surroundings of the Priory Church. That said, there are some who work not only during the festival week but throughout the year to make it all possible, and my sincere thanks go to Peter Roberts, Festival Administrator, to choir directors Andrew Carwood, Matthew Martin and Jeremy Summerly, and to Nick Flower, John Barnard, Christine Laslett, Adrian Hutton, Sheila Miles, Robin Wilson, Clare Norfolk-Brown, John d’ Arcy, Allan Edwards, Peter Norfolk-Brown and Julia Taylor for the work they do. We thank the Reverend Dr Graham Southgate for making us so welcome in his Parish, and the dedicated team of Clergy who give of their time to serve the festival not only through the Liturgy and spoken word, but in their important pastoral work amongst all those who participate. As a relative newcomer to the festival, I can say with confidence that one cannot fail to be struck by the kindness shown by the community of Edington Priory Church and the residents of the village and surrounding area, who embrace the festival with an amazing generosity of spirit. For their warmth of welcome, hospitality and support, we extend our heartfelt thanks. I hope you enjoy the 2010 Festival.